I almost feel bad about this title, like I’m teasing you into some big post full of pictures of my kitchen. I do have two pictures I’ve never shown before, so yeah, maybe I should have made the title even more exciting. When I thought about photographing my kitchen this week, I just didn’t have it in me. I’ve been fighting the weather for natural lighting opportunities this January and honestly, even if the weather were perfect, it really is a lot of work. As I was reviewing all my kitchen posts, I realized there were two places I’ve never shown that might help give someone an organizing idea. The first place is the cabinet above my ovens where I keep all the big flat stuff stored vertically between these little wire racks I found at a home improvement store. 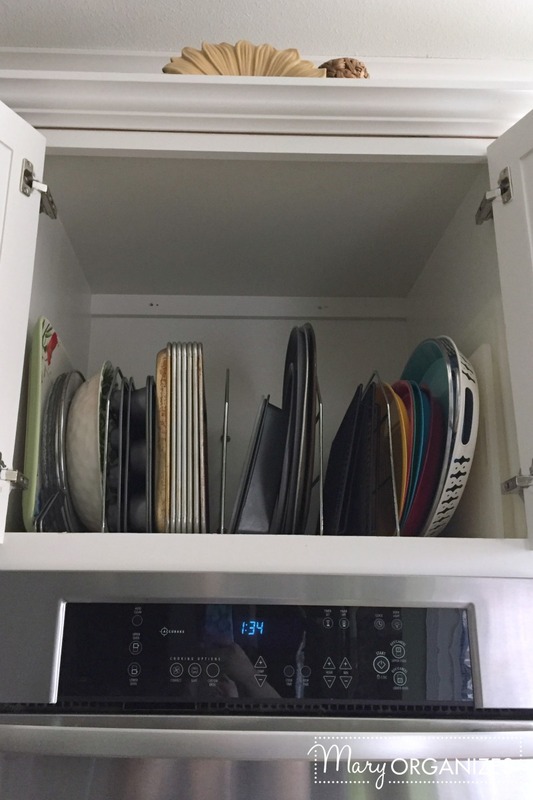 The racks are actually screwed into the bottom of the cabinet, so they hold pretty well even with heavy cookie sheets and pizza pans pressing against them. And here is the second place. This is the drawer underneath my double oven. Maybe I’ve been subconsciously hiding this drawer from you because I hoard tablecloths. As I hinted before Christmas, I have a thing for tablecloths. We use one every Sunday and many nights of the week during the Spring and Fall when we eat on the back patio. I try to use the one-in-one-out rule to keep myself in check, but over time it has really boiled down to the “if it can still fit in the drawer” rule. And that is an actual method of mine that I teach clients for a multitude of their favorite things. I’ve given the tablecloths a natural limit or boundary, and as long as I don’t let them go past that, it is okay. 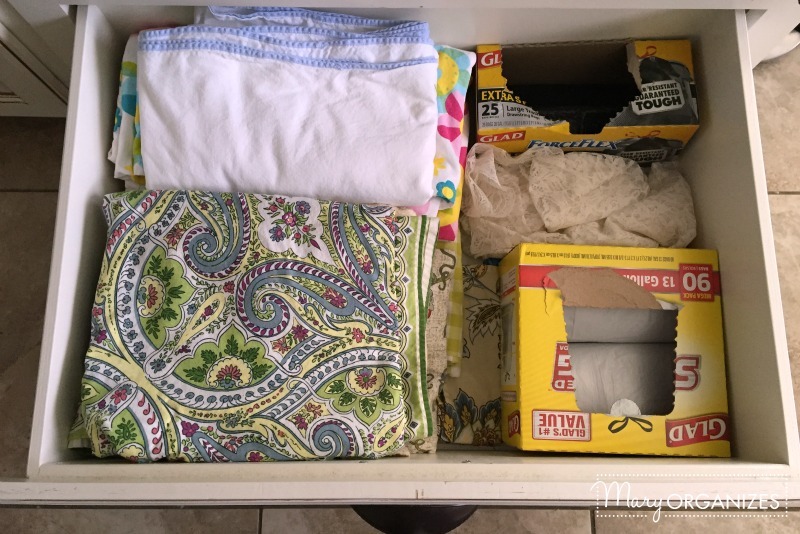 And since this drawer is next to the garbage can, we keep the garbage bags in here too, which is actually another organizing principle: proximity. Wow, one drawer and so many lessons! There you go, my two picture kitchen update. Hopefully you enjoyed a little break from your decluttering. My big accomplishment this past week has been cleaning out two junk drawers! I feel great about it, truly:) But, I love the way you’ve organized above your microwave. I’m thinking of doing that, too. I’m enjoying and appreciating your de-clutter challenge! Thank you. You’re welcome. And just keep on going! I will be forever grateful for finding your website. I figured the only area my husband would get involved would be his garage, I was so mistaken. As I decluttered an area of my kitchen, I stated how I sure could was that extra cabinet we had talked about several years ago. My great husband the woodworker he is, went out that day and made me a cabinet. It is perfect it looks just like all my cabinets in the kitchen. So for those things I have never had the place for and neglected using them due to lack of storage space have now been revitalized and I can actually use them as intended. Thank you. Now if I could fugure out this new iPad to take and post pictures I will send them to you. Thanks again. Mary, I have the cookie sheet, tray, cutting board dividers too and love them. We were encouraged to order them with our kitchen cabinets, so glad I listened to this one simple organizational option. Also, thanks for the eye-opener using the close proximity thought with your trash bags/trash can! I literally have an empty drawer under my sink, next to my trash bin cabinet and just wondered what I could put in there, no kidding! Perfect timing to read your post!! Thank you! You made my day! Problem we have is the cabinets above the microwave always have a hole in them with a power plug coming up – makes it hard to store anything there. Yeah, this is the cabinet above my oven that is on my wall, so there aren’t any cords coming up from it. 🙂 Is there a way to work around your cords?